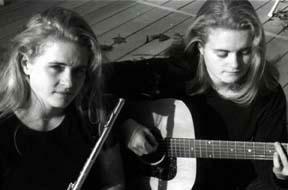 Area music fans will remember Chris and Meredith Thompson, twin sisters from Connecticut who charmed Binghamton's First Night audiences with their acoustic singing and songwriting. Their full-time touring brings them back to a familiar area: they both graduated from Cornell, and titled their first CD "Ithaca." The Thompson's first album was noted for its soaring vocals and thoughtful songwriting, and has been quickly followed by their second release, "Shadyside." Shadyside includes guest musicians and careful production, which brings a new dimension to the material. Between them, Chris and Meredith play guitar, glute, and percussion, and they both use their voices and storytelling to craft sound-poems rich in detail. Their songs rejoice in a subtle celebration of the human experience, and describe a wealth of people's dreams, hopes, and histories. The mix of innovative sound with relevant lyrics results in music that is beautiful and compelling. Their progress through the folk music circuit has resulted in accolades across the country. Stone Soup Coffeehouse in Rhode Island describes Chris and Meredith as "...truly a joy to the senses," and Victory Review in Bonney Lake, Washington, adds, "There's intelligence, and a sparkling beauty to their songs."